The world pauses. Nothing exists other than you, your bike, and the riders around you. The sound of your engine as it hums beneath you, waiting that moment when the revs are brought up. A “1” board is flashed, and 7,000 RPMs of pure power roar to life. The board goes sideways, and a green flag comes out. Instantly the world jumps to life as 20 or so motorcycles and their riders jump off the line in a bid for the front. The rush of a good launch, finding a spot in the pack and making a clean run into and through the first corner…then it’s game on! There’s nothing quite like racing. When I first got on a motorcycle, I knew there was nothing like riding. Then I moved to California and realized that there was nothing like carving up a beautiful twisty road. 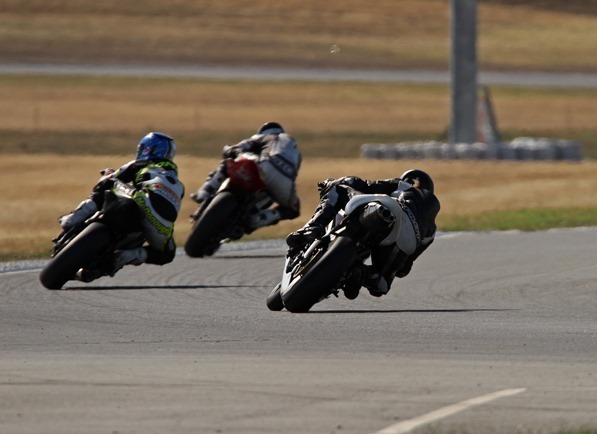 Eventually I tried track days…it didn’t take long before riding on the street just wasn’t as appealing as it once was. Then, after 8 years of riding motorcycles, I finally made it to the race grid and completed my first race. With each consecutive race this season, the joys and thrills of racing overshadow all other parts of riding – and pretty much life to be honest. 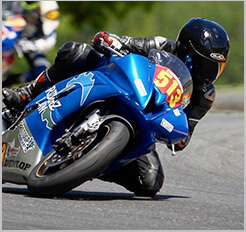 I’m basically a brand new racer with only half a season under my belt, but with each consecutive race the thrill of daily riding that I used to experience has ebbed away. There are still things about street riding I appreciate – the scenery, friends, food and exploration factor, but it’s nothing compared to racing. Round 7 taking place October 4th and 5th was the final 2014 AFM round. It was my last chance to make a bid for 3rd place in the AFemme Novice Championship. Looking forward, I knew my goals for 2015 included racing in the Sunday races, so I decided to go ahead and dip my toes into Sunday races in the final one of the year – I knew my times were to the point where I wouldn’t be dead last in the class, so figured it was time to go play with the boys. My weekend completed with a 2nd in Novice AFemme and a 3rd overall in that class, despite only racing half of the year. I finished “not last” (13th) in both of my Sunday races, despite a debacle on the first start of my second race. I had an amazing time at this final round, and the memories made will last a lifetime with hopes of many more to come! Now, however, I’m even more determined to put in a good showing for the 2015 season, and have already started to sit down and evaluate my goals, what I will need to do to accomplish them, and put this into writing to create a feasible action plan. Super stoked for the 2015 AFM season!